Ready for more traffic, more sales, more profit, and less overwhelm? Get the training, advice, and support you need to sell your handmade products successfully. → You want to sell your handmade products but have no idea where to even get started? → you have a handmade shop already but you’re hearing crickets? 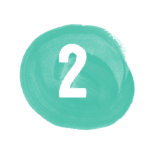 → you feel overwhelmed and just want a clear step-by-step process? You want a successful handmade shop so you can work for yourself, be creative and do something you love. The less time you have to spend figuring out the marketing and business part of things, the better. You want to make consistent sales from your shop so you can quit your current job or help support your family, and stop wondering when the next sale is going to come in. If that’s anything like you at all, then you know how hard it can be to start and grow a profitable handmade shop. ...and that's why I created Tizzit HQ. Phew! Time to take a deep breath because thankfully, this non-sense stops here. Tizzit HQ is a membership community for makers and handmade shop owners who want to sell their products successfully and build a profitable handmade business. HQ will show you how to start, grow and profit from your handmade shop with ongoing training and support, and a community of like-minded makers who won’t let you quit — all included within one monthly subscription. HQ doesn’t just guide you in one area, leaving you in the dark in others. It covers everything from creating your collections, pricing your products, marketing your shop, branding, email marketing, building your own store, photography, and anything you’ll need to learn in between. The worst enemy of progress is overwhelm. There is so much information out there that it’s easy to 1/ feel SO confused as to what works and what doesn’t, and 2/ lose time by focusing on the wrong things. HQ comes with an interactive roadmap that will guide you step-by-step no matter what stage of growth you’re in. It seems like to make it work these days, you just need 4 or 5 online courses that each cost $350+ or a business coach that charges $$/hour. 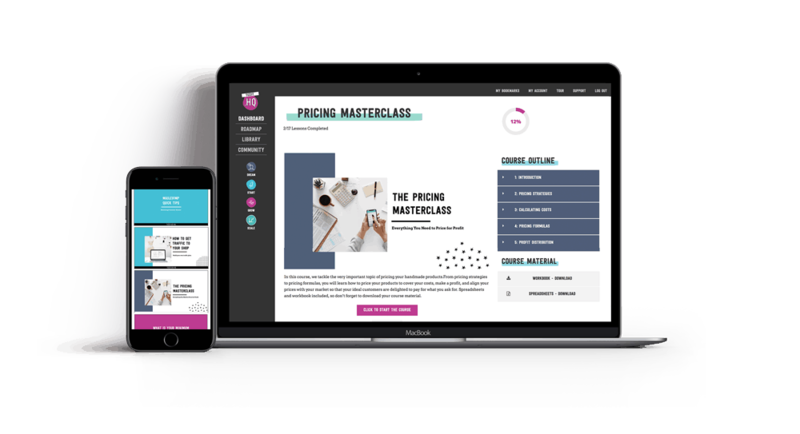 HQ was built on the premise that this is completely ridiculous: you get access to all the courses and training you need for a low-monthly fee, without compromising on quality. 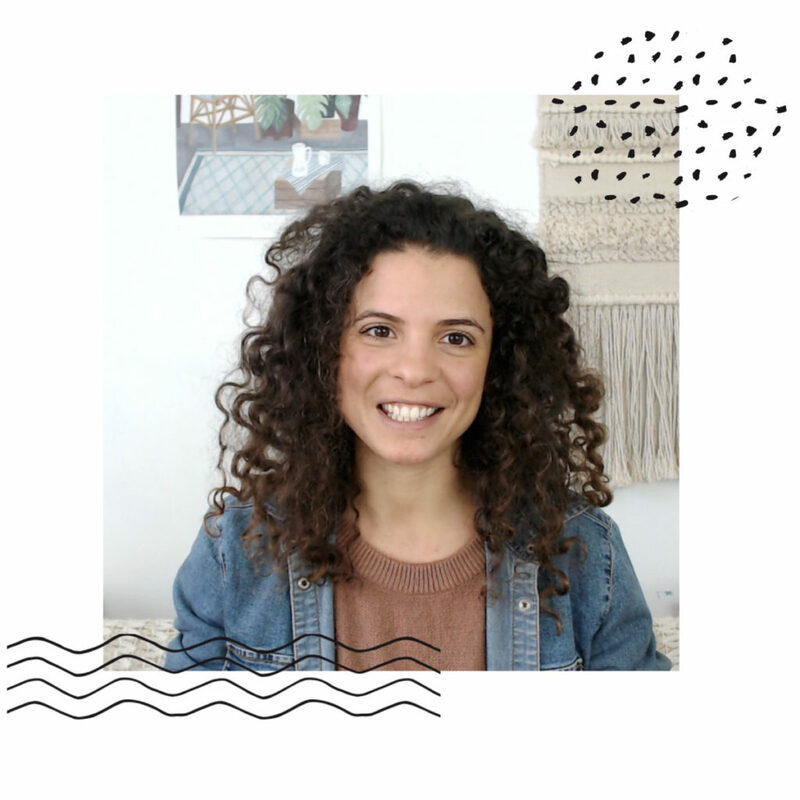 “Over the last 6 years, I’ve had the chance to work with makers and creative entrepreneurs as a graphic and web-designer, brand strategist, and online marketing and business consultant. I’ve helped thousands of makers and handmade shop owners start, grow and profit from their handmade shops with my training videos; and supported hundreds of students in growing successful shops with my online courses and programs. I am also the founder and host of the Maker’s Biz summit, a conference for makers and handmade shop owners. You love creating. I love businessing. Tizzit HQ has been fantastic for keeping me on task. The roadmap is so helpful for moving me along a clear path going forward. The courses are broken up in super manageable chunks and are very inspiring as I grow my business. 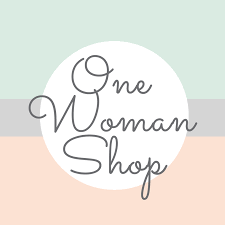 This community is friendly and super inviting, I highly recommend it for any handmade shop owner who wants to move forward with other like minded makers. Deb did a fantastic job! Tizzit HQ is comprehensive in scope and very detailed with explanations that help me understand why, and how, marketing works. 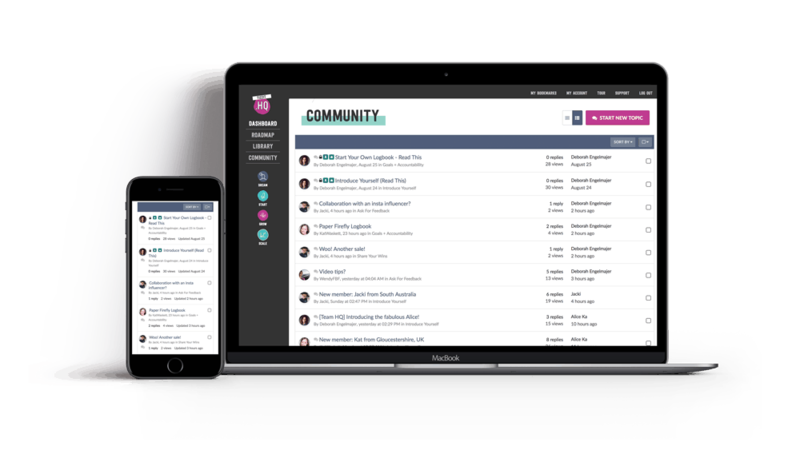 The Roadmap, Library, and community forums work together to create an experience for makers of different backgrounds to learn at our own pace. I feel it fills a gap in my business effort - the need for a comprehensive marketing system to replace my random marketing effort that works sometimes, but not consistently, and leaves too much to chance. Tizzit HQ gives me confidence that my twenty-five year old business can still grow and continue to be a sustainable source of income for many years. I love everything about this place. The design, the ease of use, the attention to every little detail, the content, the price. It is amazing. I mean, come on. Confetti when you complete a task? Who could ask for more? I can't imagine it could be better. I love it. What I really like about HQ are the community and the amazing courses. It has already helped so much. I have gained more confidence in my skills, working harder and smarter on my shops and have an amazing support system in the community. The courses help a lot with what I need to work on, the feedback in the forums is amazing and Deb is an amazing mentor! Tizzit HQ is a great one stop shop for all things related to your creative online selling. 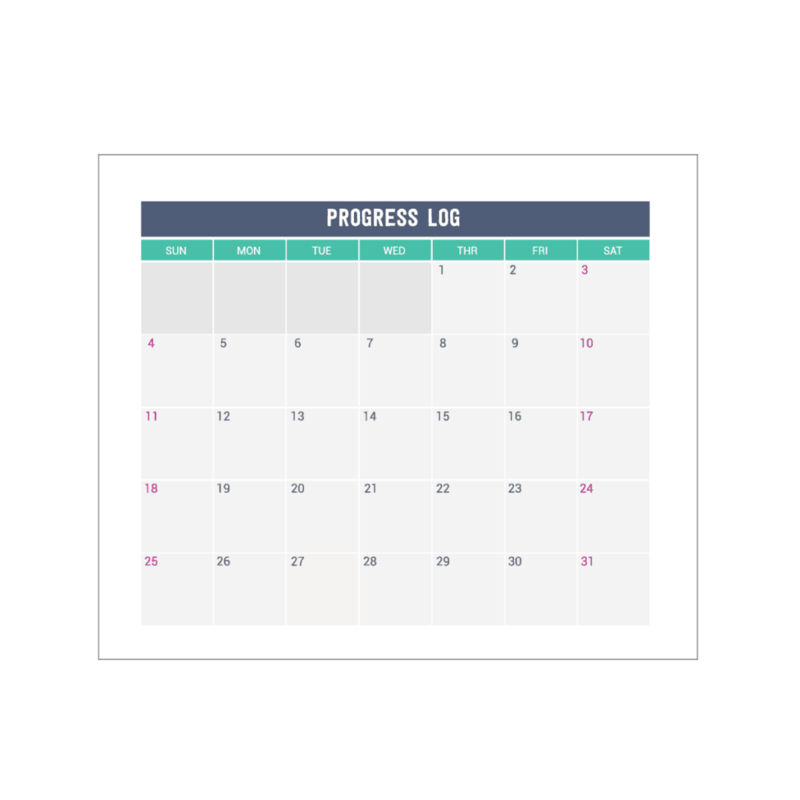 Deb has it all organized and I really like how she's split up the various stages of your business so you can focus on what matters when you should. It's a great place to figure it all out. The Maker’s Roadmap is a step-by-step guide that will take you from planning your handmade shop, to setting it up, to attracting traffic and turning it into sales, to scaling up once you’re more established. 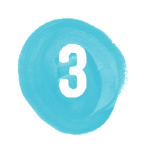 Think of it as a very comprehensive, interactive checklist. It will help you stay focused and make sure that you work on the right thing, at the right time, without getting distracted (“hey look, a squirrel!”). The core of HQ is its library of in-depth courses, allowing you to dive deep into a topic and to implement what you learn straight away thanks to the checklists and workbooks that come with it. Most courses are made up of a few modules, each with a few lessons in it, so you don’t have to leave anything to chance and can learn at your own pace. 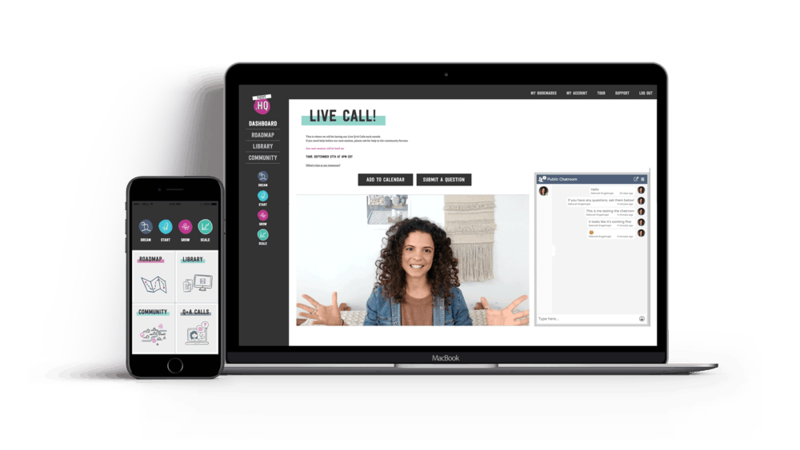 Every month, you can join Deb and the other members of HQ for a live coaching call to get specific advice and support. You can pre-submit your questions and access all the replays of past sessions within you member area, so even if you can’t show up live, you can always catch up and watch them on your own time. Inside the training library, you will also find guest expert workshops to guide you through a specific topic. 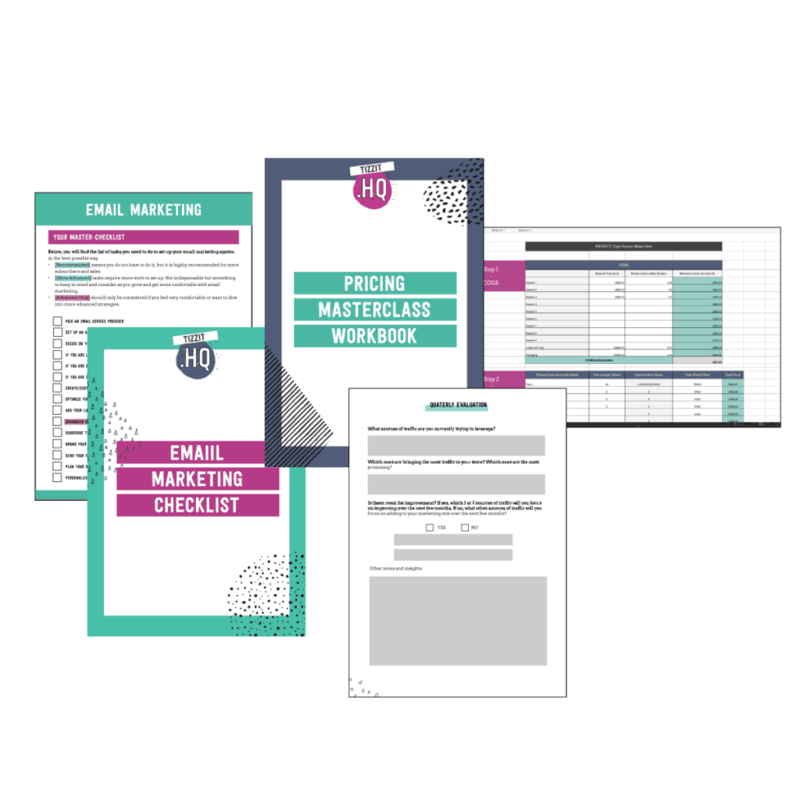 Each one is broken down into sections so you can jump to what you need the most help with, and comes with notes and checklists so you can just download or print and implement! 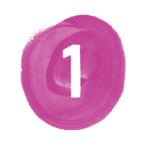 Each expert is carefully chosen based on their experience within the handmade industry. The community is the heart of Tizzit HQ. If you’ve ever felt like your friends and family (as supportive as they may be) don’t always seem to “get” what you’re doing, you are going to love it here. Get answers to any questions (small or big) that arises, request feedback, and join a family of makers that will celebrate your wins and pick you up when you feel down. Anything you need help with, Deb and the other members are here for you. HQ exists to make your life as a handmade shop owner easier, and to simplify your business and marketing efforts. 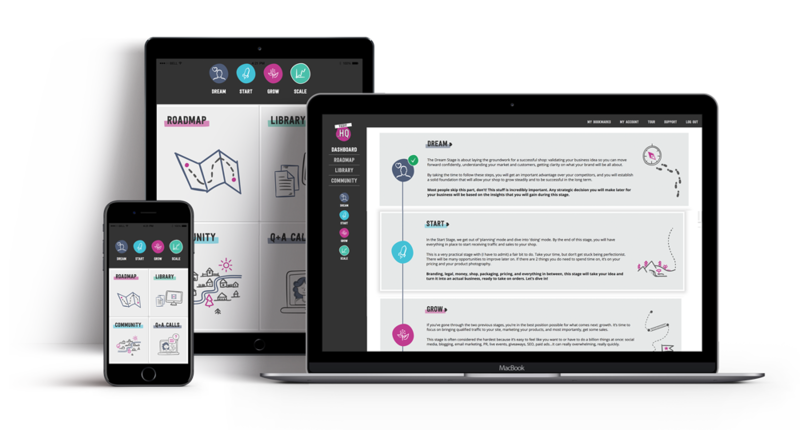 In the library, you’ll find checklists, workbooks, and spreadsheets to help you make progress quicker and streamline your processes, including for example: complete pricing spreadsheets, traffic and sales tracker, 3-month email marketing campaign planner, and so many more. If you don’t do the work, you won’t get results. That’s why we have a full section of HQ dedicated to goal planning and tracking. Life gets busy and it’s easy to get off track – having your own logbook is the best way to make sure you stay focused, productive, and reach your goals. If you really want to get results, this is by far the best way to keep yourself organised and focused, and to make sure you are getting ongoing support and help. There is already so much to learn from within the library but the best part is: new content is added to the library monthly! The library will keep on growing, and is constantly updated to make sure that you keep on top of all the latest marketing strategies (without having to actually research any of it yourself!). Really easy to navigate and use, great content (both amount and quality). I love being able to mark and track my progress, the forum is brilliant and I think will be incredibly helpful. 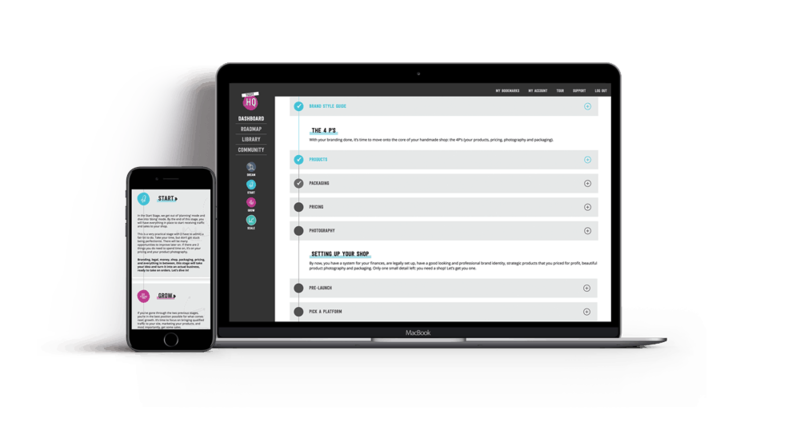 If you want great content, structured in an easy to follow step by step format with amazing support from Deb for everything to do with running your shop then you NEED Tizzit HQ in your life! Uh-oh, Doors are closed, but will re-open soon! You’ll be the first to know as soon as we re-open the doors. not sure if .hq is right for you? You want to start a handmade shop or are considering selling your handmade products to generate an income from it. 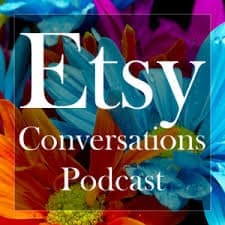 You already have a handmade shop but need help getting it off the ground, attracting more traffic and getting more sales. You love creating products but feel overwhelmed when it comes to the business and marketing aspects or running a shop. You are an action-taker and willing to implement what you learn. HQ is here to help and support you, but no one can do the work for you. You understand that starting and growing a successful handmade shop is a commitment, and aren't looking for a get-rich-quick scheme (these simply don't exist!). You do not sell or plan to sell handmade products. If you plan on drop-shipping products made in China or are mostly selling services, this isn't the right membership for you. 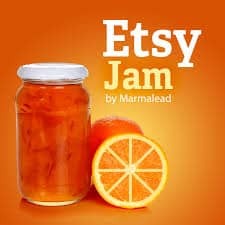 You are looking for an Etsy-only membership community. We do, of course, talk about Etsy and cover it in the training; but HQ is more comprehensive than that. HQ will help you build a successful shop, no matter on which platform. If Etsy is how, that's great! But Etsy isn't the sole focus of this membership community. You are looking for a 'quick-fix' and instant gratification. Building a successful handmade shop takes work, and although HQ will make it much easier, you will still need to do the work. more people saying nice things! Sill have unanswered questions? Take a look at our F.A.Qs below. You can also always email support[at]tizzit.co and we will be more than happy to assist you. Yes! You get access to all the courses and material inside of HQ as soon as you join. You also get immediate access to any future training as soon as they are added to HQ. No need to wait, you can dive straight in. What if I don't like it? Can i cancel? 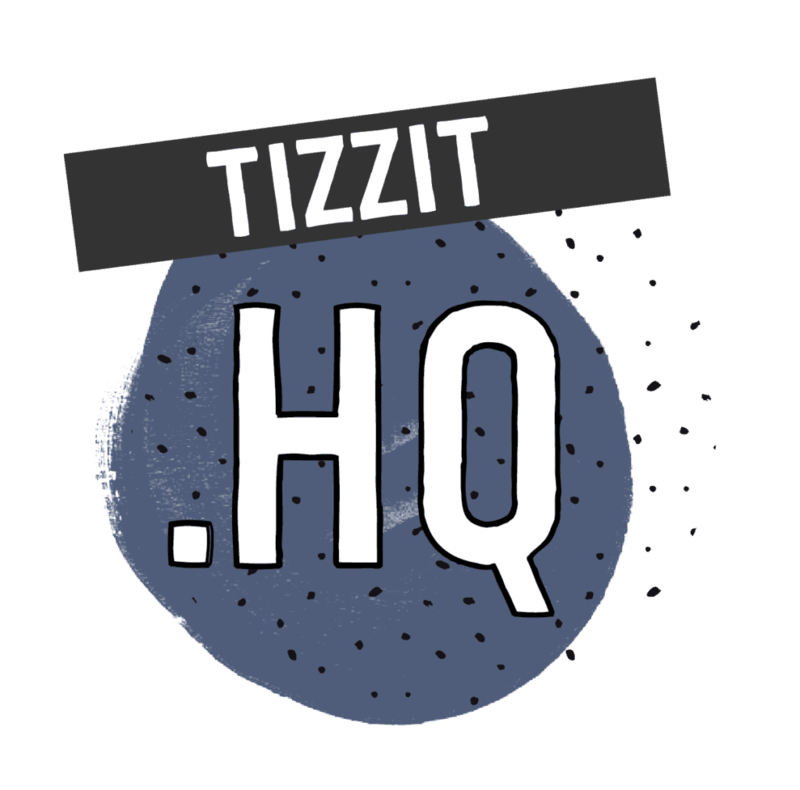 If for any reason, you are not happy with Tizzit HQ, you can cancel with the click of a button inside your member area. You don’t need to email anyone or even to tell anyone, just click to cancel. If you cancel your subscription, you will keep access for the remaining days you already paid for, and your access will be locked after that. So if you cancel in the middle of the month you’ve already paid for, you will keep access for the rest of the month, then you’re account will be deactivated. You are always welcome to join us again later, but please note that if the price has increased between the first time and the second time you signed up, you will need to sign up at the new price. You can also decide to pause your subscription instead (if you go on holidays for a month for example) and when you come back, you can start where you left off. Will the price increase in the future? As long as your subscription is active, your monthly fee will not increase. You will always pay the price you signed up for, even if the price increases after that. what kind of support will I be getting? The community is one of the best and most important aspect of Tizzit HQ. You can ask questions, ask for feedback, and get advice and support at any time from Deb and the other members of the community from within our private forums. Every month we also meet up for live coaching calls with Deb for which you can pre-submit your questions. is this for etsy sellers? HQ was created for handmade shop owners, not specifically for Etsy sellers. HQ teaches you how to build and grow a successful handmade shop. If Etsy is part of that for you, then great! But if you decide to sell on your own website instead (or as well as) we do also talk about WordPress, Shopify, selling to retail stores, and more. 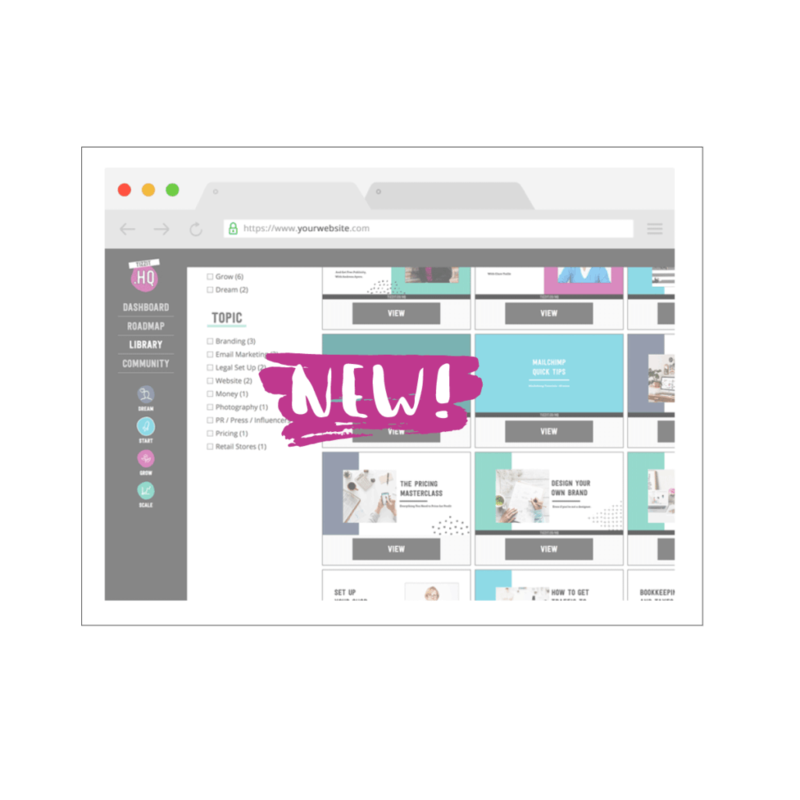 HQ is a comprehensive system designed to help you build a successful shop – no matter what platform you are using to sell your products. HQ is a comprehensive system designed to help you build a successful shop – no matter what platform you are using to sell your handmade products. Whether you are just getting started, already have a shop but need help getting more traffic and sales, there is something for you inside HQ. If you mostly sell services though, this might not be the right fit for you. I am just getting started, will this help? Yes! HQ is perfect if you are just getting started. The roadmap inside the member area start at the planning stage, so even if you don’t have a shop at all yet, but are considering opening one, you will find training to help you within HQ. I already have a shop, will this help? The roadmap and training within HQ cover a wide range of topics from the planning stages of your handmade shop, all the way through getting traffic and sales and scaling when you are already established. You will find a full traffic course, a marketing strategy course, an email marketing course and many more to help you make the most out of social media and marketing. How is this different from Tizzit.tv or the Maker's Biz Summit? Tizzit TV and the Tizzit blog offer great free resources but they don’t go as in depth as the training inside HQ does. When most videos released for free on the blog are 10-15 minutes long, the courses inside the HQ library offer several modules and lessons, as well as accompanying material (workbook, checklists, etc.) to help you dive deep into each topic and make sure that you have the resources you need to implement what you learn. 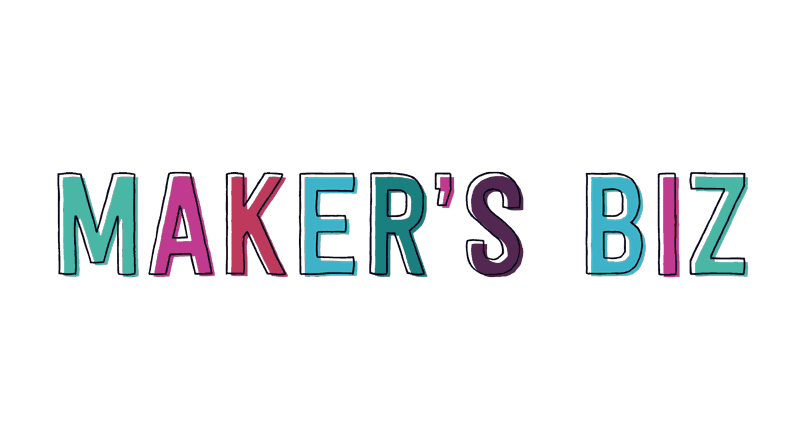 Maker’s Biz is an online conference where experts share their knowledge on a specific topic through interviews or presentations. Although you will find guest expert workshops inside HQ, you will also find tutorials, and in-depth courses that were not available during the Maker’s Biz summit and aren’t available anywhere else. A Private Supportive Online Community of makers who are on the same journey as you. Be the first to know as soon as we re-open the doors.